I am so lucky to receive free samples of Luggage Charms from My Charmed Life to adorn my bags with, blog my opinion of, and give away three Luggage Charms to 5 of my equally lucky readers! These are a fun and girly way to charm your (or your kids) bag, suitcase, purse, diaper bag, stroller, scrapbook tote, lunch box or anything else you want to leave your personal touch on – oh, and they are a practical way to ID your bags because you can write your contact information on the reverse of the tag. Ok, the engineer in me wants to give you the specs on this product. 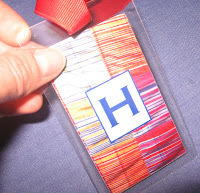 The luggage tag is a 2.5″ by 4.25″ heavy-duty laminated tag, attached to a 1″ wide grosgrain ribbon measuring 17″ in length. You can write on the reverse of the tag with a permanent marker, there is a space for your name, address, and phone number. I’m thinking that the Luggage Charms would make a great personalized addition to a gift – where you use the Luggage Charm as the gift tag, making it a very functional and very cute gift in itself. You may want to keep My Charmed Life in mind if you are searching for other types of charms – like for a charm bracelet/pin/necklace, and they also sell wedding cake pulls. Now, on to the giveaway that My Charmed Life has so generously offered to my readers. There will be 5 lucky readers who will receive 3 Luggage Charms each, and they get to choose the monogram design and letter they want on their charms. I really like the blackfor my purse and the pink for my daughter back pack and the black for my 3 month old son diaper diaper bag.. They are a super idea. I am now closing this giveaway – stay tuned for the winners to be announced in a new post as soon as the random number generator cranks out some numbers for me! I almost forgot to enter..I got lost @ the charmed website..I love it! I love charms! I would prob choose the pink paisely..I carry bags for all kinds of things..in the car, scrapbooking, keep-the-kids busy bag, etc, etc. I love the Pink Paisley — so cute! I am a soccer mom, football mom, basketball and wrestling mom. With these tags I would be a trendy mom! They would certianly look stylish on on all those sports bags. Not sure what the boys would say but hey, I’m the mom right? I love the Madras Plaid one! I love all colors, so that one totally fits my personality! I would definitely use it on my luggage since this summer will be the first time I will travel with my child. (She is 2!) Wish me luck!! I just love the black toile or the pink leopard! They will look great on either my luggage or diaper bag. The black toile luggage tag is so super cute and would look fabulous on my suitcase and diaper bag! Count me in for the Mad for Madras Plaid – great colours! I love the black toile. Thanks! PINK PAISLEY AND BLACK TOILE ARE THE BOMB!! I LOVE THEM BOTH!! Hmmm…they’re all so cute, but I would have to pick the black toile!! Definitely look great on my black diaper bag. decisions, decisions! I love the pink paisley and the black toile. But the pink leopard is cute too!I’d have to say pink paisley to put on my weekend bag for 10-year wedding anniversary trip this summer. The pink paisley is my favorite! Thanks!! I love the Pink Paisley Monogram Luggage Charm and would put it on my daughter’s diaper bag. Thanks! I like the camel plaid, would go great with our luggage! the black toile would lokk great on my black diaper bag!! These are so cute! I am in a pink phase so I would have to say the pink paisley. Plus, my niece loves pink so I would use one on her birthday present. I love the black toile monogram. I would use it on either my sons diaper bag, or older sons karate bag. Ohhh… the Mad for Madras plaid gets my vote. It doesn’t match anything I own, but since I plan to use it as a gift got my mom’s red Brighton luggage that is just fine! Pink Paisley Monogram is my choice!Lovely! I definitely love the pink leopard design, but also the Mad for Madras Plaid. 🙂 The Pink Leopard would be so cute as identification on my daughter’s bag at preschool. I adore paisley! Even better when its PINK paisley! I would use these tags on our luggage as our family lives three states away and we fly once every two years to visit. I would love to put one on my teacher bag as well! i’m toile crazy this year so indeed, the black toile.very cute! Ooooh – I love the Mad for Madras Plaid Monogram Luggage Charm – way cute! I like the black toile monogram. I’d put it on my diaper bag, luggage or library book bag. Love the Mad for Madras Plaid Monogram Luggage Charm – would be fune for my 4 girls! Like many others, I love the black toile monogram luggage charm. I’ve always loved toile and this will make my luggage (of course I have the standard black suitcase) stand out a bit. I like the pink paisley one. I like the Pink Paisley design – it would look great on my daughter’s diaper bag! My favorites are definitely the pink paisley (can’t get enough pink when you have four boys!) and the black toile. I would use these on my diaper bag, and my luggage. What a great product! I, too, love th black toile! I would probably put one on my diaper bag and a couple on my luggage. the black toile monogram luggage charm would go perfect on my little one’s diaper bag, and would be perfect for the trip we’re taking next month. her very 1st plane flight. cross your fingers it goes well. I really like the pink paisly monogram charm! Very cute. I would love it for my luggage to make it much easier to spot, and for my lunch box at work! I think the pink paisley is sooo pretty! I would use it on our suitcases, because they are black just like everyone else’s and hard to identify at the airport!! I think I have to go with the black toile, they’d look great on my grey luggage. I hate waiting at the airport trying to figure out if THAT bag is mine or not. This would be a great help. I like the camel plaid. Oooooo….the pink paisley tag is adorable. I would hang it on my infant daughter’s luggage case or diaper bag! I love the black toile and the pink paisley. They would look great on my diaper bag and luggage. I like the pink pailsey.. it would go great on one of my 3 daughters suitcase this summer as we had off to a Bible camp! I love the black toile and the tennis themed charms, and I could really use one for my luggage! Thanks Heather!p.s. did you get my message about my free cookbook giveaway? Love the black toile. I travel a lot for business and this would look great on my red suitcase! Mad for Madras Plaid is what I like. I could use this to identify my Partylite case as well as my diaper bag! These are so cute! I love the black toile! I would put it on my luggage, but a gift tag is a great idea, too. I like the Black Toile monogram charm. I would use these on my diaper bag and backpack. I would pick the Pink Paisley Monogram Luggage Charm. It would be perfect for my black luggage. I love the black toile monogram luggage charm. It would look great on my black luggage. I think the pink leopard is definately a favorite for myself and my 5 year old Kayla – however my 2 year old son may not approve. I think the black toile is wonderful too! They are too cute and such a smart idea! I would tag it on luggage, diaper bag, beach bag, library bag, and I am sure I will find other uses for them – they really are a great idea although I had never heard of them! I LOVE the Pink Paisley Monogram Luggage tag (with a “K” on it)! I’m a Brownie Scout Leader and all of the leaders have the same Girl Scout tote bag. Adding this cute tag to my tote bag would let me find it so quickly and easily. LOVE IT! These are so cute! I would love one for my diaper bag – the black toile or the madras one! Oh those are beautiful! Thanks for the contest! I like Pink Paisley monogram luggage charm because it is so cute. I will put this luggage charm on my suitcase. I love the Mad for Madras monogram. Oh your random giveaways, how i love thee.. I love the Black Tolie Monogram and not a pink Pink fan, however the Pink ones are pretty CUTE tooo!.. I bought a set of luggage from Bed Bath and Beyond for 16bucks, 4 suitcases all tucked into each other.. – The kicker it was a return and has a broken zipper which i fixed in like 5 minutes, and they let me use my $5 off a $15 coupon! $100 luggage for $11 bucks!!! Talk about a good day in Bed Bath and Beyond! Oh, I just love these tags!!! My fav is the black toile. I’d probably put it on my craft bag!! These are gorgeous! These are too cute – I like the made for madras plaid! Thanks for offering! I love the black toile luggage charm! That would definitely stand out at the airport. I love the black toile one!!! I think it would look super cute on my crochet bag and my daughters diaper bag! I’d get the black toile one for our suitcases when we go traveling. Or the pink paisley – I don’t know – they’re both so cute! It’s so hard to choose! But I think the black toile is my favorite. These would definitely be going on my diaper bag, pool tote for the summer, and any luggage for our next trip. So cute! I like the pink paisley luggage charm. I am traveling back and forth to a clinic several states away and would love to put something pretty (and identifying) on the bags I have to take with me. The pinks stand out against the black of the bag. I love the Black Toile one and would use it on my black tote back that I take with my traveling and on all kinds of other outings. I love the Mad for Madras Plaid ones! I would definitely be tagging all of our luggage because we, of course, have the “standard” black rolling suitcases & there are always 40-50 coming around the baggage claim area at the airport–this would make IDing it much easier!!! Ohhhhhh, I like the Black Toile one. Enter me in the contest! How cute! I like the Black Toile myself. But I dont travel all that much, so if I won I would give them as a gift to my sister and I think she would like the Mad for Madras Plaid. They are super cute and what a great gift. I love the pink paisly and black toile, how cute!It would look so cute on my luggage or purse! I love the pink paisley for my girls!! It would look adorable on their bags! They are all great! I’d love the Black Toile charm. I like the Pink Paisley Monogram Luggage Charm. It’s really cute. I like the Pink Paisley, Black Toile and Mad for Madras charms. They are all very classy looking. They would make great gifts – just something a little extra for someone. Thanks for all the info you pass on. I am new to this blog but I visit it everyday. I like the black toile one too. This would work great for my daughters black garment bag for her dance costumes. They all look the same, and this would make hers stick out from the rest. Oh my gosh those are SOOO cute! I would get the Burberry style plaid, the black toile and the pink leapord. One on my diaper bag, one on the camera bag and one on my suitcase, maybe I would have to order more….Thanks!! I love the black toile monogram. It adds a touch of class to a diaper bag filled with cheerios, wet diapers, crumbs, and everything else that gets stuffed in!! Love it!! I like the pink paisley, and so would my little girl. I’d probably get our last initial so we could both use them on our bags! The pink Paisley is darling! Put me down for that one!! Mad for Madras Plaid Monogram Luggage Charm looks great to me! I love the pink paisley!! Super cute for any bag. The Madras design would make finding my black luggage at the airport a little easier! It’s a cute idea for wedding gifts as well! The black toile is really cute. I like the idea of using them as a tag for a gift – I have several baby and wedding showers coming up. Although, I secretly and selfishly want to keep them for myself if I win…. I love the Black Toile Monogram Luggage Charm. So cute! I love the camel plaid and the black toile – would look good on anything!!! My faves are the pink floral (bottom) and the black toile but eally would be happy to carry around any of them. Too cute! I liked the Madras one and the black toile, but I would have to say I would go with the Black Toile Monogram Luggage Charm. I would put them on the diaper bags as preschool and church nurseries always want everything labeled! These are the easiest way! I love the black toile one the best! Very fancy! I would love to put it on my diaper bag – I’m always looking for a way to “tag” it! This would be great! Tag all my bags! It’s a toss-up for me between the Mad for Madras and the Black Toile. Either of them would look great on my luggage when we head to the beach this summer. Neat idea! i would have to go with the black toile…it’s sweet. i think it also helped that it has my initial on it already! ha. they’re all very cute. 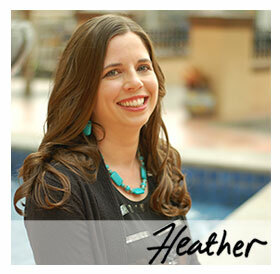 Hi Heather,I would have to say my favorites are the pink paisley and the black toille monograms. I had a hard time choosing between the 2. They are all very cute!!! The black toile is beautiful! I love the pink paisley for my daughter’s book bag! Ooh OOh, I lke the Pink “e” one. How cute!! Well, I have two children so I carry two diaper bags around and a fully loaded camera case and then my purse!! I need tags! Thanks for your consideration. I really like the Pink Paisley Monogram Luggage Charm. It’s so girly! Black Toile is my favorite!!! I would put it on my luggage since I’m infamous for not being able to pick out my luggage in the airport terminal. (my mom would be so proud of me…) Plus, if I win, I will get them just in time for my trip to VEGAS!!!!! I love the black toile and pink paisley! I think I would use it on my luggage and diaper bag. But it would also be great like you said as a gift tag for a gift! Crafty idea. I love the Black Toile monogram luggage charm. This would be great for traveling! I would love the Black toile monogram. As a mommy of 6 month old Triplet Boys i often leave the house with 3 bags. 2 diaper bags & my purse (i know i need to give the purse up but i lie mine so much LOL)I think these would add great style to my bags!